Is your skin feeling itchy or painful? Do you sometimes feel embarrassed about how your skin condition makes you look? 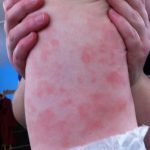 Have you been told you have a condition like eczema, psoriasis or dermatitis? Over the years I’ve worked with many clients with skin conditions like eczema and psoriasis and have found that when we look at the complete picture of what is going it can heal much faster, and with lasting results. As a homeopath, I take into consideration not just your physical symptoms, but also your family medical history, your medical history, your nutritional intake and emotional stressors. This helps me to understand the big picture of why you are experiencing problems with your skin. Working like a detective, I select an appropriate homeopathic medicine (from over 3,000 that are available) to stimulate your body to heal itself. As the body repairs and starts the healing process, your skin condition will improve. We will also look at your lifestyle and diet together so we can eliminate any triggers that may be causing the skin condition. You’ll walk away with a skin care regime that will help you to make the best choices to promote healthy skin in the future. Homeopathic medicines work very well with warts of all kinds. I have to match up your symptoms with a homeopathic and then it can work like magic. 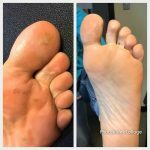 These plantar warts took about 6 weeks to heal. My client was very happy.